As a part of Purex Insiders I was given the chance to sample 2 new scents from Renuzit, the kit also included coupons to share with my family and friends! 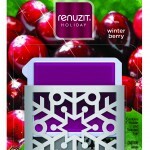 The scents were Festive Snow and Winter Berry! The Winter Berry smells wonderful! When company came over and mentioned the wonderful cherry smell I gave them a coupon so that they can get one to. I like that the scents have nice holders that fit in with the decor of my home and don't look like the usual air fresheners. I put the cherry one in my living room and the snow scent in the kiddos bathroom. The best part is the fresheners retail for around $2.50 at any store! 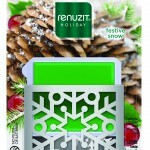 Renuzit brand provided free samples of Fresh Accents air freshener so I could review them. However, all of the opinions expressed here are my own.